2013 Seat Toledo 1.2 TSI 85 review | What Car? The new Seat Toledo like its sister car the Skoda Rapid is all about value. Move too far up the range and you'll spend Ford Focus or VW Golf money on a car that's designed to offer lots of space for not much cash. The Toledo tested here should avoid this predicament, though; it's the 84bhp 1.2 TSI model in ultra-modest S trim. That means you get a five-seat hatchback with a boot as big as a Ford Mondeo's for just over 14k. What's the 2013 Seat Toledo 1.2 85 like to drive? It won't surprise you to learn that the Toledo 1.2 TSI isn't quick. However, the engine is turbocharged, so there's a useful amount of torque from low revs. Drive the car in a diesel-esque fashion by shifting up early (helped by a gearshift indicator located between the speedo and rev counter), and it's capable of making relaxed progress. The engine is pretty refined when you take this approach, too. The Toledo isn't quite so happy when you want to get a move on, because the motor quickly runs out of puff at higher revs. The engine note becomes quite thrashy, too. Another concern is the ride, which refuses to settle at any speed on all but the smoothest surfaces. It's never crashingly uncomfortable, but the constant fidgeting soon becomes tiresome. The rest of the package is acceptable enough, with well-weighted controls, a pleasantly slick five-speed manual gearbox, and steering that's surprisingly direct. What's the 2013 Seat Toledo 1.2 85 like inside? The Toledo's cabin is not the epitome of luxury. You won't find a single plush material on the dashboard, the insides of the doors or the centre console. Even the seats feel cheap and are a little short on support. The sunglasses holder gets a soft, grippy lining, but there's no such material in the glovebox and the grab handles aren't damped. At least the design of the cabin is neat and inoffensive, with occasional 'chrome' flourishes to brighten up a sea of grey plastic. Everything feels well screwed together, too, and the bits you interact with such as the steering wheel and gearlever are respectable enough. There's plenty of space in the front for a couple of large adults, while two grown-ups will be comfortable enough in the rear. The Toledo is a relatively narrow car, though, so it's more of a challenge to squeeze three in the back. The real strength of the interior (the entire car, in fact) is the boot. It offers a massive 550 litres of space and features a practical, wide opening. Drop the rear seats and that capacity expands to 1490 litres, which is almost 200 litres more than you get in a Hyundai i30 and 270 litres up on a VW Golf's loadspace. The seats don't fold completely flat, but when you've got an aircraft hangar's worth of space to play with that's not a deal-breaker. 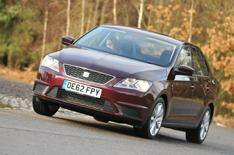 If you're buying on a budget and want an enormous, practical hatchback then the Seat Toledo should be on your shortlist. This 1.2 TSI model offers decent enough performance for the money, and backs that up with a huge loadbay. The Toledo's biggest problem is that the virtually identical Skoda Rapid with the same engine costs 400 less before discounts and when the strongest selling point of the car is how much space it offers for the money, that's hard to ignore.